Be among the first readers of The Difference. ASI has been authorized by Penguin-Random House to offer a special professional discount until the official release in February. Purchase your advance copy now. 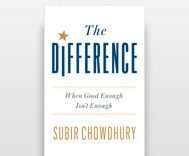 In his compelling new book, The Difference, Subir Chowdhury examines one of the biggest questions of his entire career: why do some organizations slowly improve while others exceed all expectations? In his work at ASI Consulting Group, he noticed huge disparities between groups even when the management tools were the same and implementation followed a carefully scripted plan. What is the difference, he wondered. Here at ASI, Subir needs no introduction. He is a bestselling author, a renown quality guru, and management thinker. He is also the CEO of this agency. And his ideas about the democratization of quality are also well-known and well-documented. The Difference is the latest edition of his life’s work in management and business practices. Subir holds up lessons from the last 20 years that clearly shows how people distinguish one organization from another. Even if you have the best processes and training program available in the world, your transformation will not succeed unless you first improve the culture of the workforce. This is the heart of the matter – where the hard work begins and ends. To move the dial toward excellence, you must nurture great loyalty and a passion for excellence within the people who make up the workforce. Necessarily, the work must include everyone in the organization: from the C-suite to the shop floor. The key lessons from the book are taken from his personal experiences, anecdotes from clients, and a catalog of other encounters. Subir shows us that when individuals and organizations that embrace these qualities, their work will illuminate others. “The difference,” says Subir, is when our work uplifts people around us. The Difference is a powerful guide to living a successful life and career. It will inspire you to care more deeply about what matters most—at work, at home, and in your community. Subir Chowdhury is one of the world’s leading management consultants, who works with Fortune 500 companies to improve their processes, operations, quality, and performance. He is the bestselling author of The Power of Six Sigma, and The Ice Cream Maker. He lives in Los Angeles.